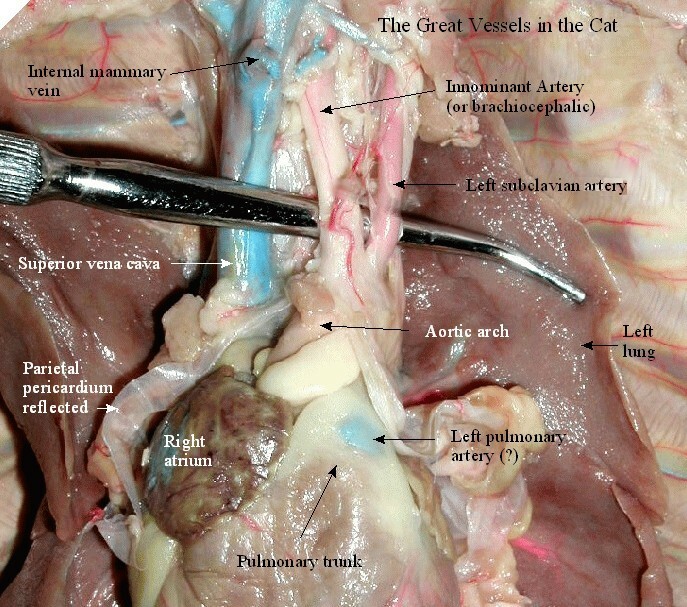 natomy of the Circulatory System in the Cat. With the chest cavity open, split the parietal pericardium by snipping upward from the apex toward the base. Peel it back to reveal the heart. Note the superior vena cava is prominent in the mediastinal space above the heart and the inferior vena cava is below and behind the heart in a direct line with the superior vena cava. Note the atria (R & L) the ventricles and the anterior interventricular artery. Note the pulmonary trunk emerging diagonally up to your right from the R ventricle. Here is a labeled view of the cat heart. You may wish to make a transverse section through the upper portions of the ventricles of the heart. Illustrate this transverse section to show the R ventricle, interventricular septum and the L ventricle . Comment on the differences observed. If you do not do this procedure, observe and illustrate one on which it has been performed. Use the blunt probe to trace the branching of the superior vena cava to produce in succession the R & L innominate veins. These branch to form the jugular and the subclavian. 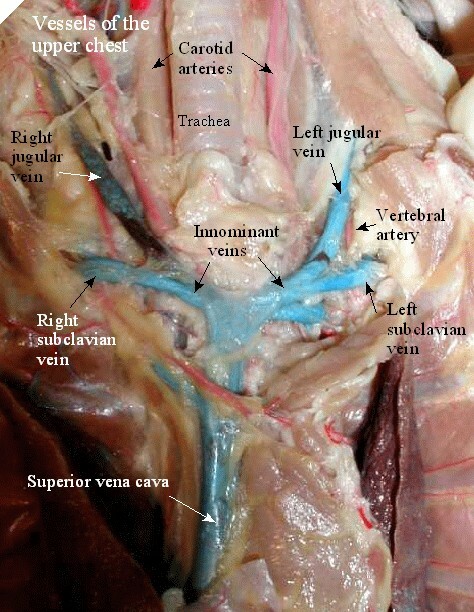 The subclavian branches to form the subscapular and the axillary veins. Here is a labeled picture of the veins of the thorax. Behind the pulmonary artery, use the probe to find the aortic arch and its two branches (three in the human): the innominant artery (or brachiocephalic) and the left subclavian. Follow the innominant to its branches: L & R common carotids, and the R subclavian. Trace this latter to the R axillary, and then the R brachial artery. The circle of Willis is formed from the two vertebral arteries below, which join to form the basilar artery. 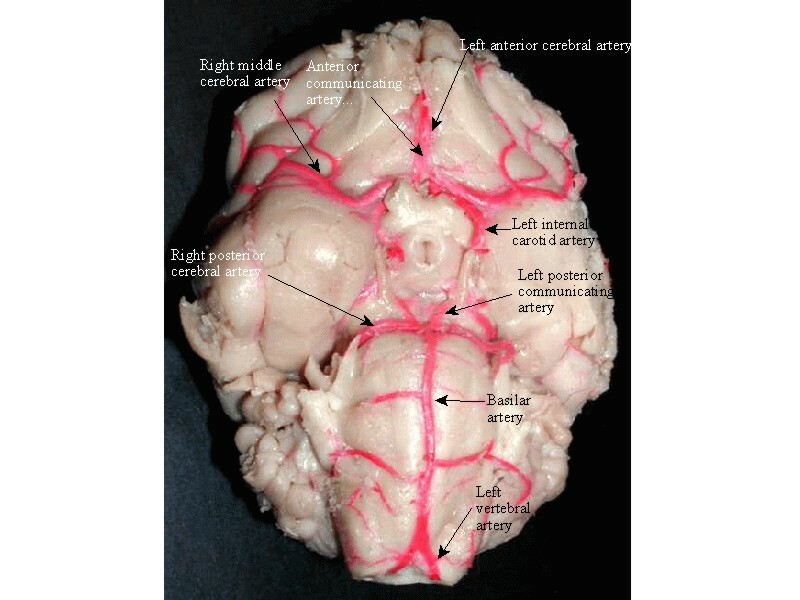 The basilar splits into the R & L posterior cerebral arteries. The internal carotids enter the cranium on either side of the sella turcica, and split to form the middle and anterior cerebral arteries. Posterior communicating arteries join the posterior and middle cerebral arteries, and the anterior communication artery joins the two anterior cerebral arteries. Here is a labeled version of the circle of Willis . Roll the L lung medially and follow the descending aorta down along the rear wall of the thorax. 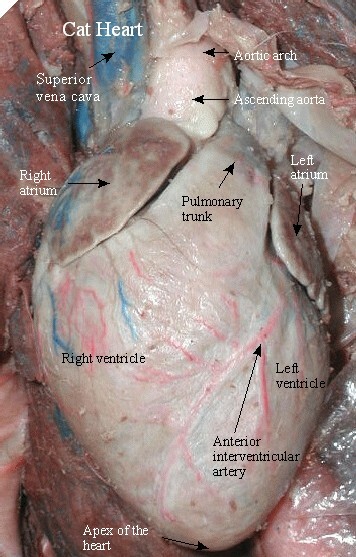 Note the intercostal arteries running between the ribs under the parietal pleura. 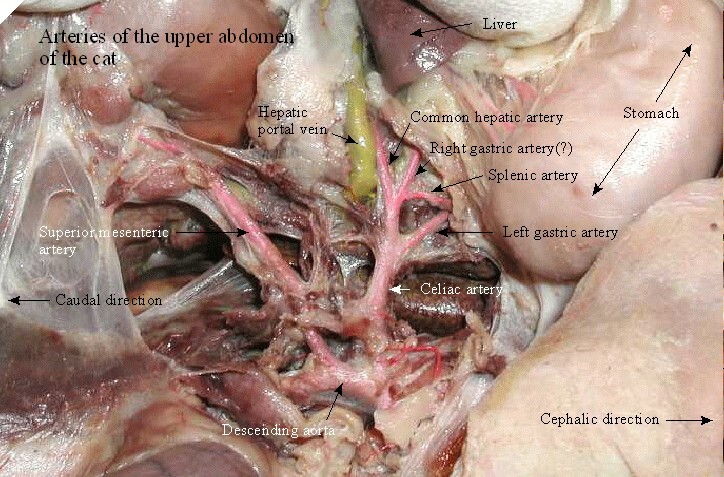 Here is a labeled version of the upper abdominal arteries. R & L Renal arteries and veins should be easily located. Note that the L gonadal vein drains into the L renal vein, while the R gonadal vein empties directly into the inferior vena cava . The R & L gonadal arteries branch off the descending aorta below the level of the kidneys. The last major branch from the abdominal aorta is the inferior mesenteric. The descending aorta ends where it splits into the R & L common iliac arteries [“external” iliac in the cat]. These branch to form the deep femoral arteries (plunge deep just before abdominal wall) and the femoral arteries at the exit point from the abdomen. The saphenous vein, the major superficial vein of the leg, runs down the medial surface of the of the leg.